MONTREAL — For one of Canada’s largest legal cannabis companies, the vote in Parliament this week to legalize recreational marijuana use represents a broad opportunity to develop new products, including marijuana infused drinks. Matteo Rossant, 21, a business graduate at Concordia University in Montreal, also envisions an expansive future, one in which he sells maple syrup, lollipops and jelly treats made with cannabis. But Rémi Letendre, 81, a retired Quebec radio host, worries that legal marijuana sales and consumption will leave cities like Toronto and Montreal overrun by stoned adolescents and marijuana tourists from the United States stumbling around the sidewalks. People across Canada were grappling on Wednesday with the legalization of recreational marijuana, which represents one of the most sweeping changes in Canadian culture in decades. Many questions remain, including whether law enforcement will be able to tame a vibrant black market for cannabis that has been thriving in the shadows and whether consumers will reject smoking government-approved joints. The Liberal government of Prime Minister Justin Trudeau had argued that legalization was necessary to eliminate an illegal cannabis industry estimated to be worth as much as $ 7 billion a year and to protect young people from the risks of illegal drugs. The law will go into effect on Oct. 17, Mr. Trudeau said Wednesday, to give provinces time to get their retail systems running. But proponents of marijuana legalization may face an unlikely challenge: customers who worry that government-approved products will take some of the thrill out of pot smoking. Tristan Peloquin, a Montreal-based author of a soon-to-be-published book, “The Little Green Book of Cannabis: A Survival Guide,” predicted that veteran consumers would come around. The Quebec Cannabis Company, the new provincial marijuana monopoly, has been examining how to sell cannabis, given restrictions that, for example, forbid glamorizing it in marketing or selling it in glass display cases behind a counter. Mathieu Gaudreault, a spokesman for the company, said customers might be able to at least smell the marijuana, which will be sold in sealed sachets, “as if they were smelling perfume.” Customers will be asked for identification at the entrance to retail stores to prove that they are at least 18 years old, the legal age for buying alcohol and cannabis in Quebec. 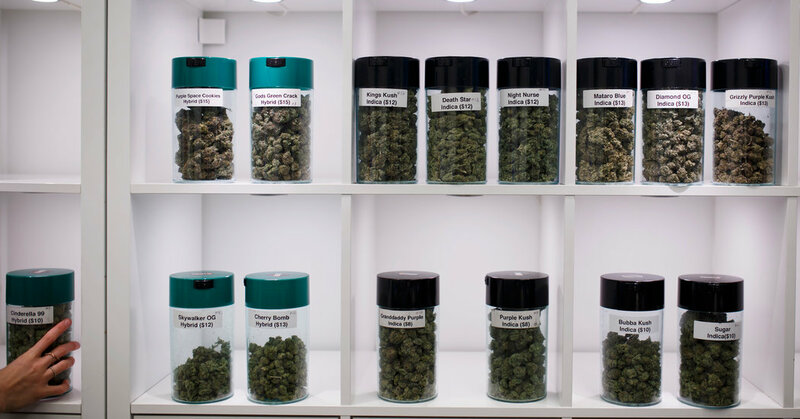 At the official stores, one gram will cost about $ 6; other products will be offered, both at stores and online, with different degrees of potency. While Canadians will soon be allowed to smoke and sell marijuana with impunity for the first time in 95 years, hundreds of illegal dispensaries have already popped up across the country, underlining the challenges the government and law enforcement will face. Trees Station, one of many illegal pot dispensaries in Toronto’s bohemian Kensington Market, has been open for two years, selling more than 30 different kinds of marijuana, with names like Pink Cinderella and Organic Charlotte’s Web. The drug is offered in capsules and extract form, too. Customers can buy THC lip balm and a canine calming cannabis powder called Calm and Quiet. Business is so good, the owners have no intention of shutting down when the new law goes into effect in October. Instead, they have plans to open two new sites. “We’re going to keep on doing what we’re doing,” said Nathan Murdock, the store manager. The store presents resents itself as if it were a medical dispensary. There is a green cross on a signboard on the street outside and a note on the door that warns buyers that they need to show an ID, as they would at an authorized dispensary. But it is just a pretense. Inside, the staff serves a continual line of shoppers from behind a glass counter, sorting through their orders wearing latex gloves. Although Canada legalized medical marijuana in 2001, and today patients must order marijuana by mail from producers licensed by the government, hundreds of black market dispensaries have proliferated. On Wednesday afternoon, Eartha Masek-Kelly, a 21-year-old musician, bought a quarter of an ounce of Green House Ocean Grown Kush from the counter as she had done every other day for the past year to calm her anxiety and depression. “Why put resources into shutting down independent retailers that are just helping people?” she asked. In effort to rein in illegal dispensaries, Ontario has passed tough laws allowing the police to shut them down. But as quickly as some illegal stores have been shut down, others have opened up. Mr. Peloquin said that some legal medical marijuana growers had been selling their surplus crop to illegal sites that peddle marijuana online. Gérard Deltell, an opposition Conservative member of the federal Parliament from Quebec City, argued that the government had rushed to legalize marijuana before law enforcement in some provinces were ready. He predicted that organized crime would continue to hold sway. “It is shocking that the Canadian government wants to become the pot dealer for the nation,” he said. Mr. Letendre, the retired radio host, offered perhaps the most dire vision of what legalization might produce. “Young people from all over the world will come to smoke weed in Montreal, and we will soon become a country of potheads,” he said as he rode his electric scooter through downtown Montreal. But other people, especially young ones, view legalization as an enormous business prospect. Mr. Rossant, 21, the recent university graduate, is starting a marijuana lifestyle magazine called Maples. He also wants to produce a variety of maple-derived, marijuana-infused products, and he is hoping that the law will be liberalized as demand grows. Dan Bilefsky reported from Montreal, and Catherine Porter from Toronto. Jasmin Lavoie and Ian Austen contributed reporting from Ottawa.